Is the Virgin Mary Saved by Works and Not Faith? I have an article on this site related to faith and works, from St. John Cassian’s view, as representing the Orthodox theological perspective on what has traditionally been a Western problem. As we related in that article, that’s because Orthodoxy did not logically attempt to define the line between works and faith as two opposite ends of the spectrum in relation to the whole free will/predestination debates of Western history. Rather, Orthodox was content as to leave it a mystery, affirming man’s free will, all the while also affirming God’s sovereignty. As it relates to works and faith in salvation, Orthodoxy affirms a synergistic view of the two, that both relate to our salvation. What it does not do, is to suggest that one precedes the other. Some in the Western viewpoint see this as semipelagianism: the view that one can obtain their salvation by first initiating and drawing God’s grace to themselves through a work based on free will. That’s opposed to Augustine’s teaching that man can do nothing to draw God’s grace to himself, and he must rely upon God’s grace to spur him on to salvation. However, this accusation is not totally correct. Because Orthodoxy, as St. John points out, does not affirm that man can draw grace to himself either. Rather, it takes an apophatic approach: by using statements of negation about God and how He works. So, for instance, Orthodoxy might say about the whole faith vs. works issue, that it does not mean man’s free will is absent in drawing God’s grace to one’s self, growing in God’s grace, but neither is God’s sovereignty in any way limited or proscribed by man’s free will. How that actually happened is what is described as a mystery. We don’t know how it works, and we are content to rely upon revelation, which shows both things are true. He that hath my commandments, and keepeth them, he it is that loveth me: and he that loveth me shall be loved of my Father, and I will love him, and will manifest myself to him." Judas saith unto him, not Iscariot, Lord, how is it that thou wilt manifest thyself unto us, and not unto the world? Jesus answered and said unto him, "If a man love me, he will keep my words: and my Father will love him, and we will come unto him, and make our abode with him. But in Orthodoxy, it relies more on revealed truth that it does human logic. So it holds both views as true, and expresses it through negation. He loves us always, all the while acknowledging that His love is dependent upon our works. Both are true, and holding to either truth does not necessitate the negation of the other view in Orthodoxy. This view of God’s theology causes all sorts of problems for those in Western theology who are used to taking one side or the other and debating it based on revealed theology. Meanwhile, Orthodoxy holds them both as valid positions without negating the other. That’s in short what I showed in my article on Faith and Works in St. John Cassian’s theological framework. For more detail and source documentation of his viewpoint, I would suggest reading that article. To summarize, faith and works in Orthodoxy are held in a synergistic framework, such that neither negates the truth of the other. To paraphrase St. John Cassian, to attempt to figure out with human logic which came first, the will of man or the will of God is to fall into different heresies by affirming one over the other. It will cause one to negate sections of revealed truth. Orthodoxy negates neither by holding this as a mystery which is beyond the bounds of human logic. One particular view of Mary, the Theotokos, is that she was all pure and thus did not need a savior. That the sinlessness was a work on her part that would save her apart from the work of Christ. And it thus puts her in a special category in that she alone in all of human history was able to achieve this type of salvation. This is a common view of Roman Catholics, though they tend to suggest that God’s grace, which is outside of time and thus Christ’s work on the cross could be applied to her before Jesus ever showed up on the scene, because they believe that only if “original sin” is dealt with can one be pure as she is believed to be. She needs a savior still due to two main reasons. First, what the West calls original sin, that is a condition of the soul that is inherently passed down to each person, Orthodoxy calls “ancestral sin.” In Orthodoxy, it isn’t an inherited something that is passed down as in much Protestant thought, but the death of the soul into which everyone is born. Orthodoxy’s solution to this condition that condemns us all to death is that Christ gives us His life. Just as there is nothing a person can do to make themselves alive again, one could live as perfect a life as possible and still not eradicate ancestral sin. In other words, it isn’t that we need to eradicate something that is passed down in order to live a holy life, original sin, but that no matter how holy we try to be, no matter how perfectly we do all that God has laid down, it will not eradicate ancestral sin from us. We will still die. In the West, one cannot live a sinless life, and if you could, you would be able to save yourself without Christ. In Orthodoxy, you would not save yourself no matter how perfectly one follows the Law. That can only be done through Christ. Secondly, because of this, anyone has the potential to live a sinless life. Whereas in the West this is impossible to do without removing original sin first, because it creates death by preventing one from being sinless. That is why Mary was able to live a sinless life in Orthodox theology and still need of a savior to save her from the death of her soul. Not because she had original sin removed, but because no amount of sinlessness could save her. Because of this, Mary could lead a sinless life without the eradication of ancestral sin and the spiritual death it causes, and the eventual physical death that results from it, because one, she is able to do that, just as potentially any of us could, and two, because doing so doesn’t negate her need for a savior. She still needed life that could only come through Christ. This applies to her ever virginity. One person attempted to suggest that she didn’t need to be ever virgin because doing so would be considered a work she did to gain God’s favor and attract His saving grace to her life. As should be evident above, this would be an impossible scenario in the Orthodox understanding of ancestral sin and how God saves us from that death. She could never save herself, or gain God’s “favor” (I’m assuming by that we are talking about His salvation, as error-prone way of looking at it as it is), through that means. Nothing we can or can’t do can give us life. Only Christ can do that. The only thing we can do to save us is to have faith in Christ. Therefore, the statement of why she needed to be ever-virgin remains as stated in my article on that topic. Because it is a statement of who Christ is. And the fact is, if she wasn’t in reality ever-virgin, it would be evidence that Jesus really was the son of Joseph, as I detail in that article, and that He wasn’t the Son of God. 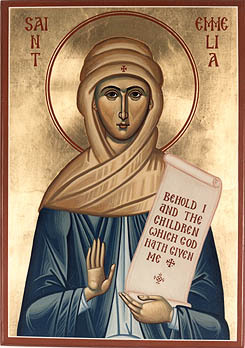 To summarize, in Orthodoxy, Mary’s “work” of remaining ever-virgin and leading a sinless life so that she would be pure enough to hold God in her womb, would in no way accrue to her salvation except as she was obedient to God’s plan due to her faith in Him as a person. For no amount of works or perfection in the Law can ever hope to restore life to us, whether it is our own perfection in following the Law or Christ’s. The Law is not the basis of our salvation. Christ is.